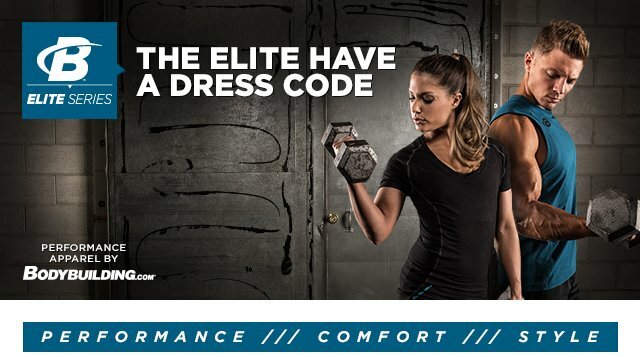 In celebration of the new Bodybuilding.com Clothing Facebook page, we are giving away a full male and female set of B-Elite performance apparel to two lucky individuals! ELIGIBILITY: Bodybuilding.com&apos;s B-Elite Series Facebook Giveaway (the “Giveaway”) is open to legal residents of the fifty (50) United States and the District of Columbia (excluding Puerto Rico, Samoa, Guam, the U.S. Virgin Islands and any other U.S. territories and protectorates), who are 18 years of age or older at time of entry (“Entrant”). Entrants must have a Facebook account. Facebook registration is free. Employees of Bodybuilding.com, LLC (“Bodybuilding.com”), Liberty Media Corporation, and their subsidiaries, advertising, promotion and Internet agencies contracted by Bodybuilding.com, Liberty Media Corporation and their immediate family members (including spouses, parents, siblings, children and their respective spouses) and/or those living in the same household of each are not eligible. In order to be eligible, Entrant must follow these Rules. Failure to comply with these Rules may result in ineligibility. No purchase necessary. Void where prohibited. SPONSERS: This Giveaway is sponsored by Bodybuilding.com, LLC located at 2026 S. Silverstone Way, Meridian, Idaho 83642 (“Sponsor”). This promotion is in no way sponsored, endorsed or administered by, or associated with, Facebook. TO ENTER: Beginning 12:01 a.m. EDT, January 1, 2013 through 11:59 p.m. EST, January 18, 2013 (“Giveaway Promotion Period”), visit https://www.bodybuilding.com/fun/2013-fb-jan-belite.html and follow the on-screen entry instructions. Entrant must click ‘Like’ on the Bodybuilding.com Clothing Facebook page and on the Bodybuilding.com Facebook page to be eligible. Entries will automatically be included in the random prize drawing described below, subject to eligibility requirements. Limit one entry per person. If Entrant submits multiple entries, the earliest entry will be accepted and all others will be discarded. Sponsor, in its sole discretion, reserves the right to disqualify any Entrant. False, deceptive or incomplete entries provided by Entrant shall render the Entrant ineligible. NO PURCHASE NECESSARY. Drawings will be held after 11:59 p.m. January 18, 2013 following the Giveaway Promotion Period. ODDS: Odds of winning depend on the number of entries received. All prizes will be awarded. No substitution or transfer of prizes, except in Sponsor’s sole discretion. Selected Entrants will be announced at https://www.bodybuilding.com/fun/2013-fb-jan-belite.html and contacted via email. Limit one prize per person. In the event the Prize is not available for any reason, Sponsor reserves the exclusive right to substitute any prize with another prize of equal or greater value. The value of each Prize set forth above represents Sponsor’s good faith determination, is final and binding and cannot be challenged or appealed. In the event the stated approximate retail value of a Prize is more than the actual fair market value of the prize, the difference will not be awarded in cash or otherwise. Each Selected Entrant is solely responsible for the reporting and payment of any applicable federal, state, and/or local taxes on the prize. All entries are subject to verification at the sole discretion of Sponsor. As a condition to receiving a prize, all Selected Entrants may be asked to sign documentation requested by Sponsor, including, without limitation an Affidavit of Eligibility/Release of Liability/Prize Acceptance Form, show proof of residency and valid identification immediately upon being chosen. If any document is returned to Sponsor as undeliverable or if Sponsor does not receive a response from a Selected Entrant within seven (7) business days of attempted notification, or the Selected Entrant declines the prize or fails to meet Sponsor requirements, such Selected Entrant may be disqualified and the prize will either be forfeited or awarded to an alternate eligible Entrant. GENERAL: By accepting a prize hereunder, Entrant agrees: (a) to release Sponsor, their agents, and Facebook from all liability, loss or damage arising out of or relating to the Giveaway, including with respect to the Giveaway, interpretation of these Rules, decisions by the Sponsor, their acceptance and use/misuse of the prize; (b) to be bound by these Rules and comply with all Sponsor requirements; and (c) that Sponsor, their affiliates and licensees may use Daily Selected Entrants’ names, personal information, and statements made by Entrant to Sponsor and information on the entry form for advertising and promotional purposes in all media worldwide without additional compensation. Entrant irrevocably grants to Sponsor the right to edit, modify and/or publish and copyright any Entrant images. Sponsor does not make any warranty, representation or guarantee, express or implied, in fact or in law, relative to the use of any prize, including, without limitation, quality, merchantability and fitness for a particular purpose. Entrant agrees that Sponsor has the right to substitute any prize within their sole discretion. GOVERNING LAW; JURISDICTION: TThis Giveaway will be governed by and construed in accordance with the laws of the state of Idaho without regard to conflict of law principles. Any controversy arising under, in connection with or in any way relating to this Giveaway shall be adjudicated before a state or federal court of competent jurisdiction located in Ada County, Boise, Idaho. Entrant and Sponsor: (i) accept, generally and unconditionally, the exclusive jurisdiction of such court and any related appellate court, and irrevocably agree to be bound by any judgment rendered thereby in connection with this Giveaway, and (ii) irrevocably waive any objection it may now or hereafter have as to the venue of any such suit, action or proceeding brought in such a court or that such court is an inconvenient forum.